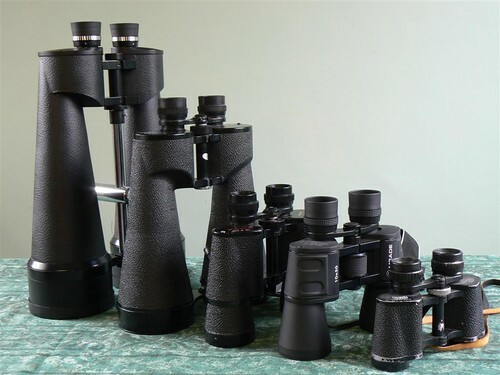 Binoculars - a working collection. The largest are the Celestron Skymaster 25x100. They need a tripod at almost 4kg, however the views are surprisingly good on deep sky objects. I have a Meade and a Manfrotto tripod for them. I can say that Manfrotto do make good tripods, and they are expensive, but well worth the money. Next is the 11x80 Celestron Comet Hunter, light enough for hand held use, so gets more use than the big one. I don't know if was just lucky but the optics on these are superb. The smallest are the zeiss, I've owned these for about 25 years. The meades were from Lidl. The quality of these ranged from just OK (for the price) to very good. I chose the best of 10 pairs and got some that are very good indeed. to the edge of field, but have a significant barrel distortion, but not really noticeable for casual astro observing. I keep a pair of vintage Olympus 6-15x35 zoom binoculars at work - despite the poor reputation of zooms they are very good. Astronomy with binoculars? - It's good fun!. Latest edition to the collection is a pair of Greenkat 10x50 with quick focus - not an asset for astronomical use but very convenient for garden use.